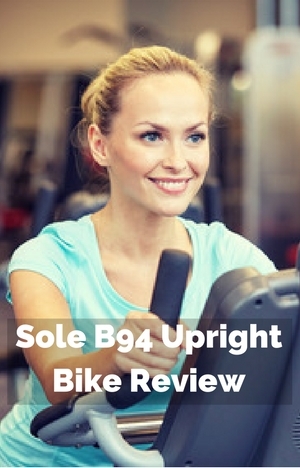 The Sole B94 Upright Bike is rated for light commercial use. And it is priced for that use. It is priced higher than many other home upright exercise bikes. But it is built for more hours of use a day than those made just for the home. So you would expect to get something more for it in terms of durability at least. Along with that it comes with pre-set programs, customizable programs a fan and speakers. It has a heavier flywheel at 20 lbs than you see on less expensive upright exercise bikes which should give it a more fluid and natural pedaling motion. In my review I look at all these features and more to see if it lives up to the price and you get real value for the extra you pay for the bike. To start here’s a look at how steady it holds you when you are working out. It has a heavy steel tubing frame and stabilizer bars to stand up to repeated use. It holds the bike steady so it doesn’t shake or wobble whatever the intensity of the workout. The shroud that covers the drive and flywheel is made of aluminum so it won’t crack or split from the stress or bangs. The light commercial bike rating means it is suitable for 5 hours use a day rather than what happens at a commercial gym or club. Which should be more than enough for most people at home. The warranty is lifetime on the frame, three years for parts and electronics and year on labor. This is a good warranty which probably reflects the fact it can be used for light commercial applications as well as the home. Most people have had a good experience with the bike liking the overall quality of the bike, although there has been a couple of issues with the console (but isn’t common). Most find it is durable and expect many years from it. The seat can be moved vertically and horizontally to get the best fit for a comfortable and effective workout. The adjustment needs to be done while you are off the seat. From customer experience it seems the bike can properly fit people between the heights of 5 ft and 6 ft 4 ins. It doesn’t take long and is easy to do. It won’t really get in the way of getting on with a workout. It is only if there is multiple users that there may be the need to do it as the seat amy have been moved for their requirements. For the height it is just a matter of undoing the adjustment knob, pulling it to release the pole and moving seat to where you want it and releasing the knob and engaging the pin in one of the preset holes and then tightening up. The horizontal adjustment is similar except you can adjust it to where you want it. It is easier to do and quicker than it sounds from my description. To help to make it quicker you can mark your adjustments on the pole with permanent marker. People above the max height I’ve identified can still use the bike but they are likely to find, depending on leg length, that they don’t get the full leg extension as the pedal and feel cramped. At the other end of the scale, those below the minimum, again depending on leg length, will struggle to reach the pedal at its furthest point making it uncomfortable and unusable in many cases. The 20 levels of magnetic resistance provide a good range of toughness from very easy to tough. The top levels of the resistant may not be to the liking of those who are experienced and want really tough workouts in particular it’s not really tough enough for standing on the pedals like you would a spin bike (See Sole SB900 for a bike that is better for that). For most people they will get a workout as tough as they want just not those who are experienced and expect very tough workouts (Although one customer has mentioned this can be increased with the help of a service technician adjusting it mechanically). The resistance levels are controlled through the console manually by the user or automatically by the program. In a program the resistance can be changed by the user if it isn’t at the level you want. The console is powered by your wall supply. So with the resistance adjusted and controlled through the console it means you can’t change the resistance or use the console when there is a power outage. You can change the resistance level one at a time by pushing the up/down buttons on the console or you can jump to one of 10 levels by pressing the quick jump buttons. The levels are 1, 3, 5, 7, 9, 10, 11, 13, 15, 17, 19 and 20 – it can help save on the pressing of buttons. The change between the resistance levels is still smooth – it doesn’t suddenly go hard or easy – it moves up in a progressive way so there is no jerkiness experienced. It has a belt drive and a 20 lbs flywheel. This operates quietly and is low maintenance. The flywheel weights more than most upright exercise bikes (although less than you see on a spin bikes or indoor cycles). It will give a smoother pedaling feel then you get with lighter flywheels especially at the higher levels of resistance where it pulls the pedals through for a more 360 degree pedal stroke. This is all the shroud which keeps it away from pets and children. It also stops dirt and sweat getting into the moving parts and jamming it up or otherwise damaging it. The oversized pedals include plastic straps to help with keeping your feet in the best position on them as well as preventing them from slipping out. They are designed to be used with athletic shoes or similar. The straps can be a little tough when new to get the hole in them over the tab on the pedal – but they do soften making it easier to do. If you are the only one using the bike there is no need to this after the first time you do it again – you can just slide your feet into place. If you don’t like the straps you can take them off. The pedals are attached to a 3 piece crank which should be durable and strong enough for the most challenging workouts over time – they shouldn’t be breaking or flexing. The pedals are further apart than on a road bike but are closer together than on many other upright exercise bikes, This helps to provide a more natural feel to the pedaling. Also, the pedals have a slight angle inwards (or cant) of 2 degrees. This helps to keep legs in alignment so there is less outward pressure on the knees, ankles and hips in most cases which reduces stress on them – it will help reduce chance of pain and injury which can arise when using any bike for long periods of time. If you pedal backwards there is no resistance and the console doesn’t register the pedaling. Seat. The seat has a gel cover which provides for most a very comfortable experience allowing them to ride for as long as they like. Gel seats tend to be among the most comfortable available. But because it is a bike seat some people won’t like it. You can try padded bike shorts and maybe even covering with another gel seat cover. If you’ve not sat on a bike seat for awhile you probably will find it uncomfortable at first anyway and it might just take a little time to get used to it. If that doesn’t work you can replace the seat for one that is more to your liking. It takes standard fitting bike seats so there is a lot of choice. Noise. The bike operates very quietly. You can exercise and watch TV without disturbing others. You can use it at any time day or night and you shouldn’t disturb others or wake them including young children. You can use it in an apartment without your neighbors knowing you’re exercising – to be sure if you live in an upstairs apartment you may want to put it on a rubber exercise mat so nothing transmits below. Handlebars. These are covered which helps to make them non-slip and more comfortable to grip when hands get sweaty. The position or angle of them can’t be changed. They do give plenty of scope for different hand positions although leaning on them maybe uncomfortable with the way it is attached to the console – the raised attachment on the top of the handlebars and also the covering isn’t padded so you arms may ache if you lean on them too long. Dust and Dirt. It’s not going to add too much to your cleaning routine. The biggest problem is sweat. It’s important to wipe this off the bike so that it doesn’t get on corroding the bike – it has been made to protect against this but sweat over a period of time will start rusting and jamming the bike if left. It’s advised to wipe it down after use. It only takes a few minutes at most. Depending on floor you have place the bike on you may want to put the bike on a rubber exercise mat to stop sweat dropping on to it. The bike is heavy when compared to many other upright exercise bikes. It weighs in at 123 lbs. It needs an area of 23 by 44 ins when not in use. It can fit in a corner or maybe under the stairs but probably not in a closet if you can’t leave it out between workouts. Fortunately it has 2 transport wheels at the front of the bike that you tip the bike up on to when you want to move it. There is a handle at the back of the bike that you use to lift up the back and on to the wheels. One person can do this and then move the bike to where you want but an extra pair of hands would come in useful especially if you need to go round tight corners. With most of the weight on the wheels it is a relatively easy job except for going round tight corners which can take a little negotiating. The wheels work well on most surfaces although on softer carpets and surfaces you can find that you need to slide it if they jam up. When moving over wood floors you do need to be careful as they might scratch or dent it. The bike does need some assembly when its delivered. The most difficult part of the bike has been assembled – the drive and frame are together. Most people can complete the job in an hour or two with some able to do it quicker. It is much easier than most kitset furniture you buy from IKEA. You are required to attach the rear stabilizer bar, console mast, console, seat, handlebars, pedals and plastic pieces to the bike (less steps than many bikes). The tools you need to it is included with the bike. If you have your own tools these will make the job quicker although the tools included are reasonable. The instructions and diagrams are clear and the pieces go together easily. It can be done by one person but a second pair of hands can make it easier especially when attaching the console – so one can hold it while the other attaches it. The console has a lot of features that can help you have a more effective and convenient workout. At the top of the console are the speakers and fan. Next is the 9 inch display (diagonal) that shows all your progress and measures. At each side of the screen are 5 buttons (a total of 10) for jumping quickly to 10 out of the 20 resistance levels. Below this are the buttons for controlling and setting up your programs for your workouts. The next row of buttons are used to cycle through the display, alter resistance, start and stop programs and move around programs while you set them up. Under this are the jacks for audio in for using the speakers, headphone jack and water bottle holder. It has a display that is bright (too bright for some), easy to see and has visual appeal. The display shows a lot of information in a mixture of graphics, numbers and dials. Starting out at the left the first dial shows resistance level, the central one lets you know time and distance. The right side lets you know the RPM. Underneath these on the left are your calories burned, pace. In the center is a track showing progress and a profile of the workout – by columns signifying a segment and height the resistance. On the right is your pulse in numbers and a column with percent of heart rate scale. Underneath this is a section that lets you know how many laps completed, speed, level, watts, segment time. You can scroll through these by pressing the display button below or you can set it to scan through them showing each set of data every 4 seconds. You do get a lot of information and fortunately it has the actual numbers as well as columns and dials which are good for a quick glance but don’t let you know the situation like the numbers do. It doesn’t come with a huge selection on programs with some bikes giving you a choice of over 20. This bike comes with 10 with 2 being ones you can set up for yourself. It does provide some variety to the workouts and challenge. It does stop it being overwhelming as it might be with too much choice – even so I’d expected a few more for the money. Quick Start. You press the start key and you can get going and adjusting the resistance as you go. The progress display shows a track and not a dot matrix display of the workout. Manual Program. This is similar to the quick start program but instead you push the manual button and then enter age, weight and time. You then adjust the resistance level as you go. It starts at level 1. Profile Programs. There are 5 pre-set profile programs. These are hill, fat burn, cardio, strength and interval. The names give you an idea of what to expect from the program and the profile is described and shown in the manual. You are asked to enter your age and weight, time you want the workout to last and the maximum exertion level which helps to modify programs to your fitness level. It is possible to adjust the resistance while you workout if it isn’t what you want to be training at. Customize Programs. You can set up 2 of your own profile programs. You enter these by pressing either User 1 or User 2. If you’ve already set up a program you can then follow along to it or modify it before you start. It works in the same way as the profile programs in that you have a segment of time that you have a set resistance and then moves on to the next segment and so on.. You can change this at any time by pushing the up/down buttons. Heart Rate Control Programs. These programs automatically adjust the resistance to keep your heart rate at the selected percentage of your maximum heart rate. You can select either HR1 which is 60% or HR2 which is 80%. To calculate this you enter your age, and for calories you enter your weight. You can then set a time for your workout. You can change the percentage you want to achieve before you start or during the workout (which changes the intensity). To use this program you do need to be either gripping the hand pulse sensors or wearing the heart strap. It is great this bike works with both hand pulse sensors and heart rate strap and the strap is included – you don’t see that happen very often. It is a great feature I think. Often hand pulse sensors aren’t reliable. They either give the wrong reading or you only get an intermittent reading and in some cases one at all. They’re temperamental as it can be due to hands too wet, too dry, gripping too hard and so on. Some people don’t have any problem but many do. It’s not just this bike but any that have them. The other problem with them is that you have to keep your hands on when you are following a heart rate control program or want a continuous reading of your heart rate. The moment you take one hand off one of the sensors you lose your reading. So, there is no moving the hands for a different grip for comfort. At the end of your workout you do get a summary of it. If you want a record of your performance you need to do this manually entering it into your journal or fitness account. It doesn’t work with bluetooth or a fitness app for uploading information direct. The power cord is plugged into the front of the bike which can cause some issues with facing the bike where you want with making sure it isn’t trip hazard – when you want it facing away from the wall. There is a power switch next to this point for turning the bike on and off per the manual but later models appear to have done away with this. Instead it will turn itself off after 15 to 30 minutes of inactivity. All the accessories are part of the console but they are described here rather than as part of the console section. Water bottle holder. This will only be able to hold only small bottles at best as it isn’t very deep. It’s better for your keys or an MP3 player. Speakers. The speakers provide only a passable standard of sound. The volume and program selection is controlled by the plugged in device not the console. Headphone Jack. Instead of using the speakers you can plug in your headphones which probably provide a better sound experience and also means you can listen to your music or podcasts without disturbing others. Media Shelf. This is just below the display. When you put on a tablet it does cover it up so you can’t see your progress and measures when watching movies or reading. The bike is steady so there is little change of the devices falling off as you workout. Fan. The fan is at the top of the console. It blows out a gentle breeze which provides a little cooling effect – it’s not a big blast but it does help a little to stop you overheating. Customers in their reviews are positive on balance with 73% rating the bike a 4 or 5. Considering the price you’d probably expect better reviews but that may contribute to the lower rating because people are expecting more for the money. That’s understandable. A few people have had issues with the console stopping working after a few months and then experiencing a delay in getting it fixed or replaced. Some people who had an issue due to delivery have had a great experience with Sole being very responsive and quick to fix the bike due to delivery issues. Some people don’t like the seat as is to be expected – it is down to personal preference – it is possible to replace the seat for one you like – it has a standard bike fitting. The overall experience is that you get a good durable bike that lives up to the price and provides a quiet and effective smooth workout. For the price you get a bike designed to stand up to light commercial settings where there is likely to be more use and more users than you’d get at home. It has a heavier flywheel and the ability to follow along to preset programs and also set up your own. This does set it apart from other more affordable bikes although some of them do give you more pre-set programs and ability to upload to a Fitness account ( See the Nautilus U616). When a checked Amazon it qualified for Prime and free shipping. With the Sole B94 Upright Bike for the price you’d expect some more features particularly with more pre-set programs to give more variety but there is still a good selection to help add some variety and challenge for your workouts. They can be modified for your fitness level. Overall it is a good solid bike that can stand up to the pressure and strain of cardio workouts. It can be used by beginners as well as more advanced exercisers too although if you are looking for really tough mountain climbing workouts you are likely to find the resistance isn’t tough enough for you. The display screen is a good size and provides a lot of good information to help to keep you on track. It’s quiet, can be moved easily and can be quickly adjusted to fit a variety of different people. You should also get plenty of trouble free workouts for many years. So if you expect a lot of usage then this is a bike to take it. Decent bike — except two consoles failed in four years — each one lasted two years. Sole replaced first one under warranty, but charges $200+ for second one. Considering recurring console failure (and it is complete failure making bike unusable) cost is much too high. Sorry to hear about that. Thanks for letting us know.